“Headspin”, a brand new song from BUTCHER BABIES, can be streamed below. The track is taken from the band’s third album, “Lilith”, which will be released on October 27 via Century Media. The follow-up to 2015’s “Take It Like A Man” was produced by Steve Evetts (THE DILLINGER ESCAPE PLAN, SEPULTURA, SUICIDE SILENCE) and marks the band’s recording debut with new drummer, Chase Brickenden, who replaced Chris Warner last year. Pre-orders for “Lilith” are available now in both physical and digital formats. 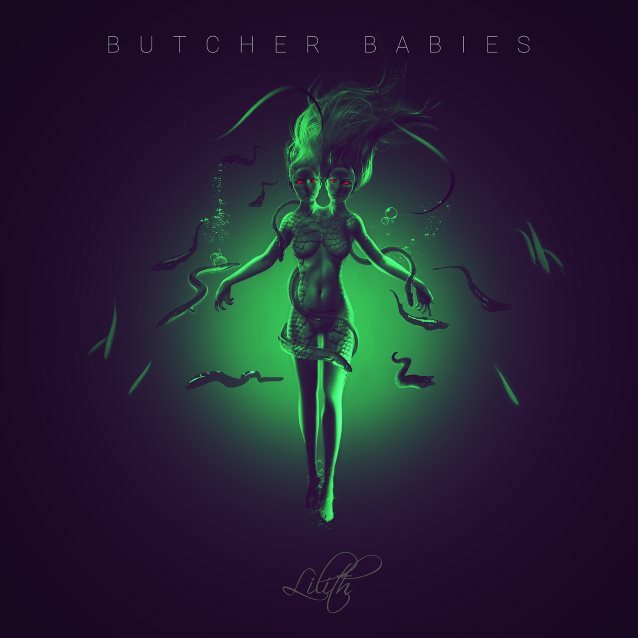 BUTCHER BABIES co-vocalist Heidi Shepherd stated about “Lilith”: “After a year of writing and recording, we are thrilled with the growth and maturity of this album. Leading with our title track, ‘Lilith’, the artistic development within the band shines. “We worked with producer, Steve Evetts, to bring you the rawest form of BUTCHER BABIES. No Auto-Tune, a hundred percent real drums, real guitars, real bass, and an all-out BUTCHER BABIES assault on your senses. As we know in this industry, these standards are quickly replaced by machines and can eliminate what makes a band an actual band. Shepherd stated about the “Lilith” title and cover artwork, which can be seen below: “Historically, Lilith has become demonized as a representation of promiscuity and disobedience. We, however, see her as a positive figure. A symbol of autonomy, sexual equality, and full control over your own destiny. “Lilith is the supreme representation of the left-hand path woman: independent, having discarded the patriarchal yoke, and not afraid to use all the tools available to her, including her sexuality, to gain the most out of existence. The eels in the cover art represent sleek symbolism of new beginnings and adventure. “With this album, we have musically taken a leap through old boundaries and landed in new oceans. It is said that a the dream or visions of eels is confirmation that the path we currently lead is the right one. Added Harvey: “When we were thinking of titles for our album, we wanted to find something that embodied sensuality, lust, danger and power. We kept going back to Lilith. We researched Lilith and her origins in different cultures and forms and knew that this figure, once feared but now a beautiful, symbolic middle finger to repression, would be a perfect representation of our album. “The cover art we created with our graphic artist perfectly pulls together the last year we’ve spent working on ‘Lilith’. “I’ve always loved water themes and there is something terrifying yet calming about the deep sea; submersing yourself in it could be the death of you, yet at the same time it’s cleansing and renewing. BUTCHER BABIES will support HOLLYWOOD UNDEAD on a U.S. tour which will kick off on October 1 in Atlanta, Georgia.